General Otho Hinton wasted no time betraying the friends and family who posted his bail; within days of his release on January 25, 1851, he fled Ohio, never to see his home or his wife again. He was an unlikely candidate to start anew as a fugitive at age 49, being accustomed to a life of privilige; his previous escape from the law lasted only six days after the General – described in the wanted notice as “very fleshy” and “stout” – turned himself in, complaining he was hungry. 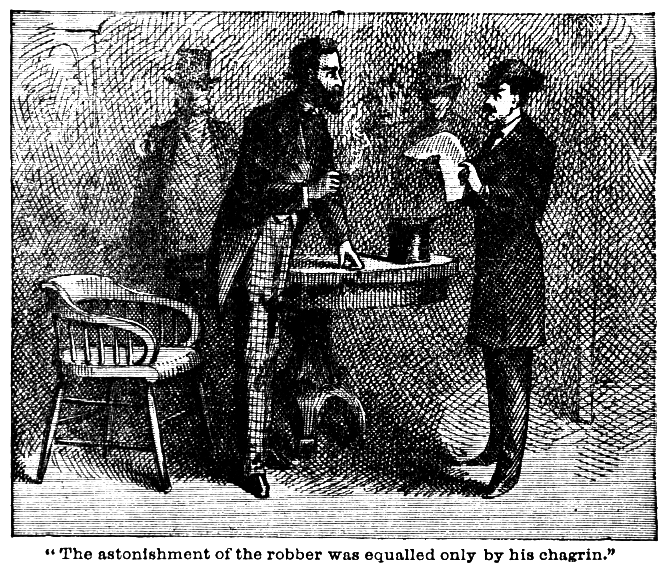 As Hinton’s trial date approached, his attorney brother-in-law Thomas Powell – who was among those who put up bail – presented an affidavit to the court stating Hinton sent him a farewell letter shortly after he fled, writing he was in New Orleans and was planning to bury himself and his troubles in the waters of the Mississippi. Since the fugitive General was now presumably deceased, attorney Powell argued, could we have our bail money back, please? The judge was not moved to agree. Even though he was a wanted man, we can track Hinton’s whereabouts over the next several years fairly well through mentions in the press; in fact, federal authorities might have nabbed the guy by simply taking subscriptions to a handful of Ohio newspapers. Let’s interrupt the story to explain almost everything previously published about Hinton’s past comes from a 150 year-old book, “Guarding the Mails” – see sidebar in part II – and most of what appears there is provably untrue or dubious. Today, however, there are thousands of searchable historic newspapers online so we have a pretty good sample of what was being written about Hinton at the time. And there is plenty to read; he may not have been America’s first criminal celebrity, but editors were eager to print every crumb of news or rumor they could about the notorious General. Readers all over the Midwest were kept abreast with little news summaries, sometimes only a few words long reprinted from another paper which might have picked it up from yet another paper. Most of the time the items didn’t bother explaining who Gen. O. Hinton was. Everybody knew. By far, the most repeated story about Hinton during his years on the lam concerns a supposed spotting of the General in Cuba. In May 1851, about three months after he fled, newspapers widely reported someone had seen and spoken to Hinton on the island where he was then going by the name of Hanten. Most papers stated simply those details, but some mentioned this news came from Sandusky, Ohio. Fortunately, the original newspaper story can be found online; the article from the Sandusky Clarion said its source was “a gentleman recently returned from California.” That the witness wasn’t named, did not say how he knew it was really Hinton nor provided any other details about running into the infamous fugitive makes the claim sound specious. While it might be true, it has more of the whiff of an Elvis sighting. …[Mills] traversed California in various directions, crossed over the Sierra Nevada to Utah Territory and visited the most remote places in pursuit of the object of his search. It is fully ascertained that Gen. Hinton was in the state when Mr. Mills arrived, but this fact had found its way into the Atlantic papers, which probably reached there in time to put the General on his guard. The U.S. Marshal, however, has found several gentlemen who were formerly acquainted with Gen. H., who have been cognizant of some of his movements since his arrival in California, and who are fully aware that he some time since left for some other quarter of the world–probably for South America. Marshal Mills should have stayed at home in Ohio and read the newspapers, which reported a few weeks later Hinton was in Oregon running a public house in Portland as “Samuel G. Gordon” – that being the maiden name of the wife he abandoned. And as they were apparently not divorced, Mr. Hinton-Gordon added bigamy to his crimes when he married 25 year-old Louisa Hopwood there in May, 1853. The Ohio newspapers apparently didn’t know about this marriage when a slew of news items about him appeared later that summer. Someone in Oregon recognized Hinton and tried to blackmail him. He – and Louisa, presumably – went to Los Angeles where he was identified by a stage driver who supposedly also demanded money for silence. The driver turned him in and Otho Hinton found himself arrested for the third time. Hinton was taken up to the District Court in San Francisco, but discharged after a few days; the stage driver couldn’t be found to testify against him – perhaps he managed to scrape together the extortion money after all. So yet again the crafty General escaped justice, this time staying behind bars for only a month and a day. A warrant eventually arrived from Ohio, exactly 3½ months after his arrest in Los Angeles. The U.S. Marshall wrote back, sorry: Hinton had been released and “a few days thereafter he [sailed] for the Sandwich Islands, where I believe he now resides.” His new whereabouts were no secret; Ohio newspapers were peppered with little items about his change of address. The Sandwich Islands – AKA Hawai’i – was a sovereign nation at the time, and Hinton family genealogists have presumed he went there because there was no extradition treaty with the U.S. That’s not true; a treaty had been in place since 1849, but seems not to have been used in Hinton’s lifetime. The government might have exercised it if John Wilkes Booth was hiding in paradise but the ilk of Hinton was just not worth enormous bother. Yes, our good Otho, his legal prowess unfettered by an actual legal education, was now advertising himself as “Attorney and Counselor at Law and Solicitor in Chancery” – while keeping his day job as a carpenter. During his Honolulu years he seems to have stopped posturing as a “General,” maybe so Hawaiians wouldn’t worry he was the advance man for a U.S. military invasion. Otho Hinton was down on his luck – or was he? Apparently his goal all along was just to bide his time in Hawai’i until charges were dropped, or so his son Edgar was telling folks back home. That happy day came in the summer of 1857; whatever the statute of limitations on his felonies – either 3, 6 or 7 years at the time (please consult an early 19th century legal scholar and get back to me) – the U.S. District Court at Cincinnati dismissed the case without comment. As you can imagine, papers nationwide could not resist printing that juicy nugget. He certainly was not acquitted and contrary to the most oft-told tale about the General, he did not escape prosecution by having himself declared dead in the Sandwich Islands. Yet if he was free to return to the states, where should he go? Probably not back to Ohio, where his legal wife had already suggested she was itching to shoot him – and that was before he jumped bail and left her in penury, not to mention illegally marrying another woman. From this point our portrait of Hinton has less clarity. The Ohio newspapers lost interest once he was no longer a wanted fugitive, and what little they did print about his doings out here was often wildly wrong. Not that there was much written about him out here, either; during his years in Santa Rosa the town had a small weekly newspaper with almost all local news on a single page, which was later squeezed further to make room for dispatches from the Civil War. Otherwise, you might expect there would be some mention about the arrival of this affable 56 year-old guy who called himself a General. One reason he might have moved to Sonoma County was because he had relations here. In Healdsburg at the time lived his first cousin, Charlotte Hinton Miller. Shortly after Hinton arrived in the area her husband died, leaving Charlotte and their five children destitute. Within a few months she married a Santa Rosa relative of her late husband, Joel Miller, a neglected figure in early town history. He was a pillar of the community – one of the founders of the Christian Church, County Recorder from 1857-8 and court clerk before and after. Someone new to the area who wanted to be a lawyer could hardly hope for a better family connection. The undersigned members of the Bar beg leave respectfully to report that we have examined the applicant [illegible] and find him qualified to practice law as an attorney and counselor of this Court. But there being in his past history some charges touching his moral character which although probably acceptable of full explanation, yet not having the evidence before us to satisfy us in that respect we recommend a postponement of his application as a member of the Bar until further explanation can be made. Unfortunately, they were not specific as to which “moral character” issue troubled them. The two felony charges for robbing the U.S. mails? Failing to abide by sworn promises to appear in court? Bail jumping and spending seven years evading arrest? Bigamy? We don’t know how much the locals knew about his past at the time – or in years to come, for that matter. The Santa Rosa newspaper never mentioned his history, although Bay Area and Sacramento papers revealed some of it later. But as always, Hinton could con anyone into believing he smelled sweet as a rose no matter what was on his shoes. The county Bar Association must have accepted his explanation because he was admitted to the state Bar a few days later, then opened a law office with a partner a few days after that. All told, it was only three weeks between his denied petition and having his name on the door as Santa Rosa’s newest attorney at law. Without deep plowing through court records we don’t know how successful (or not) he was in his legal career; papers at the time usually didn’t mention who was representing someone in court, although it is known he was the attorney for Judith Todd’s abusive husband in her divorce suit (see: “RIDGWAY’S CHILDREN“). Hinton mostly kept a low profile in his final years except for his attempt to become County Judge in 1859, about a year after he arrived in Santa Rosa. Running for judge seems to have exhausted his ambitions. Between then and his death in 1865 he didn’t do much in public, although there generally was a passing mention of him somewhere in the Santa Rosa newspaper every year. He had been a die-hard Whig back in Ohio and Lincoln’s administration was dominated by former Whigs; thus on New Years’ Day, 1864, Hinton penned a nine page fan letter to Lincoln, which would probably have been a hanging offense in pro-Confederacy Santa Rosa, had anyone around here known about it. He signed the letter as just Otho Hinton, leaving out his claim to be a General which was probably wise. His personal life was quiet as well. His daughter Mary Ellen apparently joined him here in 1863, son Oscar in 1864, and his long-suffering wife Rebecca moved here in 1865. Before she arrived, however, he unexpectedly died at home on March 5 of that year, having been seen around town the previous day appearing in fine mettle. There is a family joke that once he learned she was coming he died of fright. NEXT: MOMMY, WHY DO WE CALL IT HINTON AVE?